This sounds logical, but is fatal for the lamp hypothesis. How so often in "alternative science" this lamp idea only "works" by omission of important details. You might have noticed that I emphasized the word "two" in Garn's comment. Why? Because "two" is the key word. Every "normal" lamp needs two electrodes to produce light, a simple light bulb or the Garn-construction. "Well, and where is the problem?" you might ask. Simple. 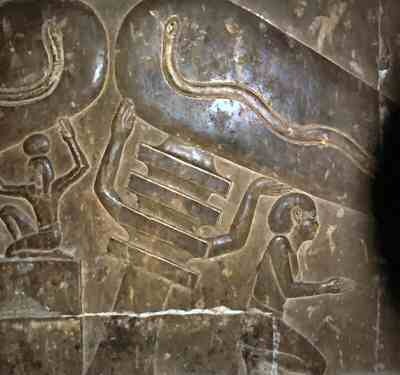 The problem is, that the "working" lamp image in Dendera is only one of six. And from all six pictures this is the ONLY one where something reaches "into" the "bulb"! On both pictures the surrounding hieroglyphic texts can be seen. I will come to them later. Even worse: on the left part of the relief there is no Djed pillar at all, although the authors claim that this is an essential part of the lamp! On both images more essential elements are missing. The twins below the lamp have gone, symbols for the two polarities. There is only one manikin on each side. Also, the “high voltage”-sign, the woman in front of the twins, is gone, not to forget the “high voltage generator” on one image. Therefore, according to the authors, these objects could never had been lamps. Neither a Garn-type nor a "normal" light bulb. And the explanation? 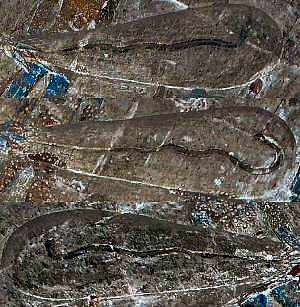 This is a picture with so-called snake stones. Krassa and Habeck are making fun about them, as "silly explanations of Egyptologists" - therefore I will discuss their meaning on the Egyptological pages. Contrary to the “light bulbs” in the crypts these snake stones are common in other temples of that time – as hieroglyphic letter! Without any connection to light or lamps. Here from the Edfu-temple:. 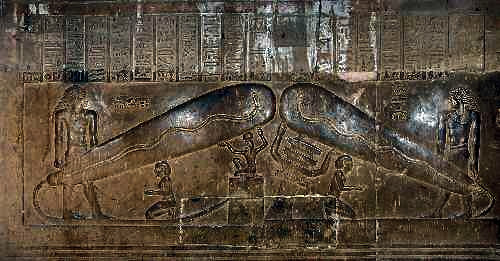 Fact is, that the "lamp explanation" works only for one of six large pictures, and for none of the uncountable snake stones in this temple and in all of Egypt. The given explanation was: "The Egyptians saw the whole thing just a short moment, so they couldn't remember how the thing really looked like". But you must admit that this is silly. As you remember: the core of the lamp-story is, that the Egyptians used those things for centuries, even millennia, to routinely light out their pyramids and tombs. And yet they could not remember how their daily tool looked like? Even the "reduced model" (which also contradicts the initial no-soot-"evidence"), that only priests hat this magical instrument and showed it a few times a year to the astonished masses, fails, because they had to have the objects at hand and could have copied them. If we take in account that the “working” model is dramatically outnumbered by the non-working types we can only conclude that the idea is, from the scientific viewpoint, flawed. I mentioned above that there are at least six images of these objects, Up to now I showed only the three depictions from the subterranean crypts. The other three are above ground in a room of the temple itself, the so-called cult room G. Sadly, they are high above in an ill-lit narrow room and hard to capture on film (or photo sensor). I made some pictures in 2007, and although the quality Is bad the important features can be recognised. None of these “lamps” would work. There is no second electrode in any of these images, the “generator” is missing, and the “high voltage-woman”. Most interesting are the colours used. The Egyptians used different colours di differentiate between materials used. Our electro-friends claim that the stalk connected to the lotos flower is an electro cable. As we can vaguely see on the colour images it is striped green-brown. This pattern was used by the Egyptians to depict bound reed! Like used in reed floats. An electric cable made of reed? I do not think so. Well, they are BLACK. That's bat. 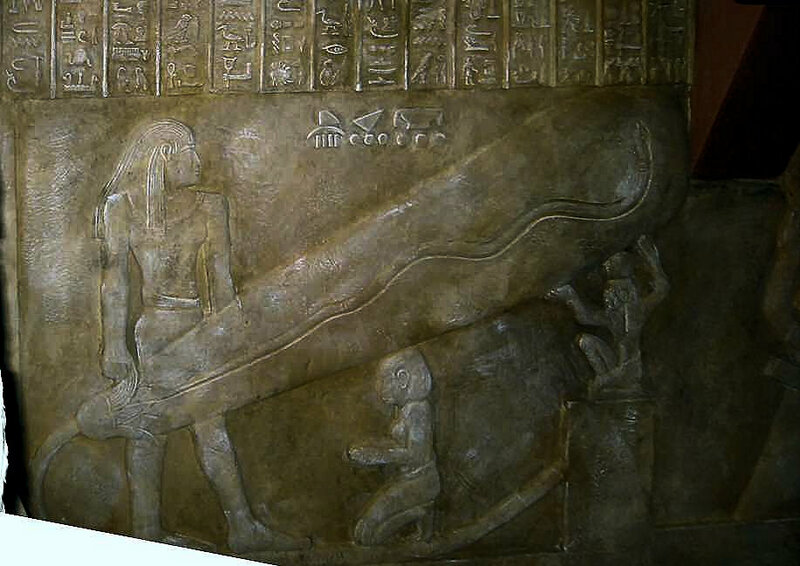 Are the Ancient Egyptians the inventors of UV-lights? Was Dendera the first large capacity discotheque? OK, let's assume that our authors did not know these images. But they hat the translation of Waitkus. 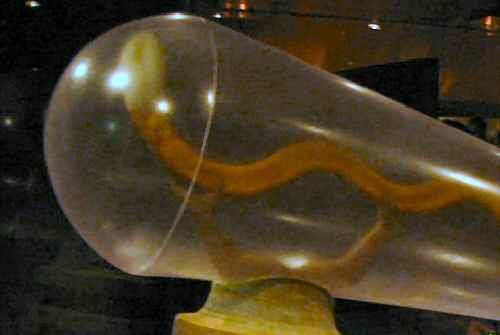 In it there are several texts dealing with the snakes. In the crypts cult shrines were stowed, and besides of the religious descriptions of the scenes the materials the shrines were made of are mentioned. 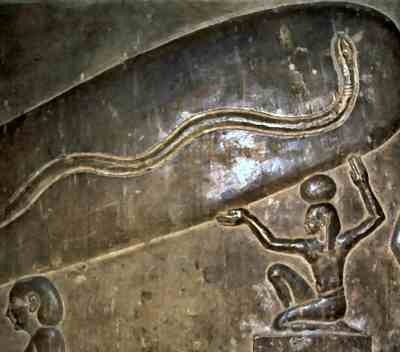 The snakes are described as “Metal, hight 4 hand palms wide”. The “bulb”, called “glory of Harsomtus”, was made of “gold and precious stones”. Oh, the authors KNEW that, they used it even in their book. But in a very funny way: they ponder about if the objects were not really functioning lamps, but “electro-technical documentations”. WHAT? No lamps??? But there are more problems demolishing even the basic idea that those things could be light bulbs of any kind. Krassa/Habeck seem to believe that the objects on the images are shown in their natural proportions with regard to the “priest” behind the lamp (although they are wondering, that some other people are shown smaller than the priest). If we use the priest as scale, the objects on the relief must be around 2.5 m long with a largest diameter of one meter, and a smallest diameter of 50 centimetres! Regardless of the construction used, the bulb had to have a near vacuum inside - can you imagine the air pressure resting on such a device? Well, we don't need to guess, we can calculate it. With a length of 2,5 meters, a largest thickness of one meter and a smallest thickness of 50 centimetres we can calculate the volume roughly as a truncated cone of approximately 2 m length ( Volume = Pi * h /3 * (r12 + r1 * r2 + r22) and a hemisphere of one meter diameter (Volume 2/3 Pi r3). The combined volume is around 1,12 cubic meters, the surface of the object amounts to approximately 6,3 square meters. If the object is evacuated, a pressure of about 63 tonnes would rest on a Dendera object. To withstand such an immense pressure, the object would have to be quite thick-walled, at least two to three centimetres thick. The weight of this bulb would be then approximately 750 kilograms. And this monster would be nevertheless a ticking time bomb: a small crack in the glass by uneven cooling with the manufacturing, and the Dendera lamp implodes with the force of a bomb. The fragmentation effect might be deadly in the periphery of several meters! I for my case also know of no vacuum glass bulb of similar format from modern manufacturing, and this might have its reasons. We cannot do it - but the Egyptians could? Although they had no technical industry at all? Err - no. "Rubbish" one lamp-fan told me, the bulb could have been filled with a noble gas. Sure, noble gas grows on date palms :-) Without a real industrial technology it is impossible to get those gasses. There is no trace of a technology needed to extract them before the 20th century. 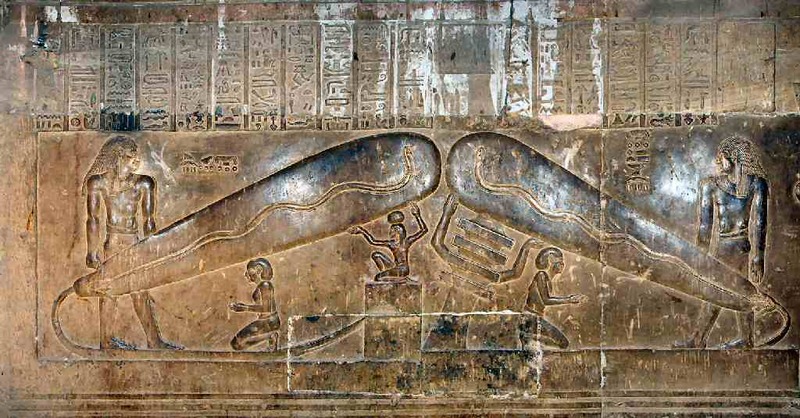 Also: the Dendera lamp would have to contain enough gas to fill at least 713000 (!!!) halogen lamps with a lighting performance of together 14 million Watts (at one bar filling pressure)!!! And twice may be guessed what lights up more brightly. In both cases the Dendera construction is characterized primarily by its uselessness. A simple bulb or a 500 W halogen lamp needs fewer resources, is simpler and safer against production defects as such a monster. It has its reasons why we use today small bulbs and no Dendera giant, even 100something years after Edison. "Ancient Egyptian glass is among the finest from the ancient world. Despite its great technical competence its origins and technology are still imperfectly understood. Lucas (1962:179) notes, that while glass may have been made sporadically before the 18th Dynasty (c. 1550 -1070 BC) it was probably a fortuitous product resulting from accidents in faience manufacture, while after that time its production was deliberate. ... From 1500 BC onwards, glass emerges as a regular, if high-status, product in Egypt." So glass became a prestigious high price product around 1500 BCE - more than 1000 years after the great pyramids were built. 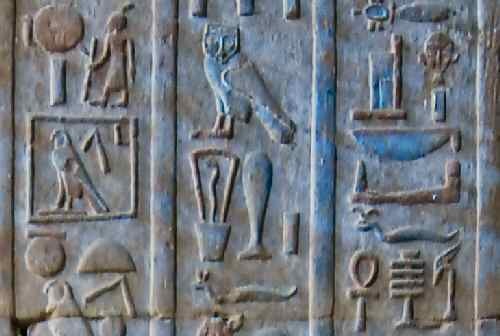 Let us now take a look at Dendera and it's connection to Pharaonic Egypt. To support an influence of the Dendera-"technology" on ancient Egypt the temple must be old. And, so the authors Krassa/Habeck in their book, the temple IS old. Not only old, but prehistoric, too. Well, that's it, then? "The outstanding event of the building and religion policy P.s ' XII. is the inauguration of the Edfu temple on 7 February 70. 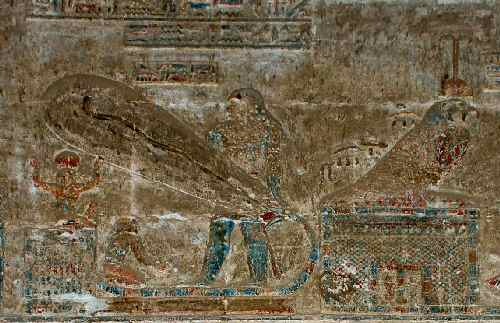 In Dendera he begun in the year 54 B.C. with the construction work of the Hathor temple......"
Still any questions? The temple was built in an era long after the end of dynastic Egypt, about 300 years after the reign of the last Egyptian pharaoh. 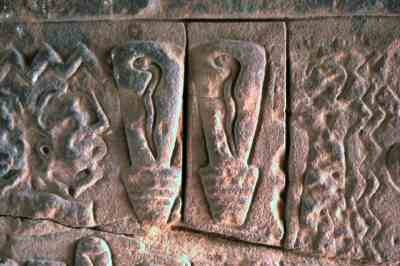 And: no temple before Dendera shows symbols like these. There is no connection between these symbols and Pharaonic Egypt. Whatever they are: the whole idea of electricity in ancient Egypt has died with this building date. Naturally, Erich von Däniken, the famous ancient astronaut guru, uses Dendera in his works. The Dendera-”bulb” was one of his main attractions in his now closed Mystery Park in Interlaken/Swizerland. And more and more often I got emails telling me that the Dendera-lamp there works, so my pages must be wrong. So it is time to take a look at the exhibit. Sadly I was not able to visit the park myself, but Markus Pezold from the internet-magazine Mysteria 3000 was so kind to take some photos for me. I also got parts of the commentaries played when standing in front of an exhibit. I already mentioned the scene from Däniken's documentary “Außerirdische – kehren sie zurück?” where he “demonstrated” the capacity of a Baghdad battery. A multimeter gave a buzzing noise when connected to a battery reconstruction and showed a voltage of “0293”. Afterwards, a glowing Garn-lamp was shown, suggesting that it was powered with the battery. Only on a freeze frame the real voltage can be seen: the multimeter is set to 1 V interval, and it shows 0.293 volts! No gas discharge lamp can be powered with that minimal voltage – and it does not make a sound when a cable is attached. Sadly this kind of foul play was continued in the Mystery Park. One exhibit should show a reconstruction of the Dendera objects, powered by Baghdad batteries. In front of the lamp four vases, alledgedly Baghdad batteries, were placed, one of them transparent. The cables leading fom the batteries to the lamp are clearly visible. Then the show begins. A fluid is pumped into the transparent vase, and on a strange gauge a needle turns upward, reaching a red marked section. Then the lamp ignites and Däniken himself triumphantly shouts “It burns, that is the proof! But that is nothing more than a deceit, as I explain in the following. But first here are some pictures. As I wrote in the battery section, a Baghdad battery gives an idle voltage of about 0.5 volts, four batteries together 2 volts. Connected with an appliance less than one volt is left. This does not start a gas discharge lamp. The batteries are therefore pure decoration objects pretending to be the power source. And even as prop ups they are silly, because the fluid is filled into the vase, where it is completely useless. The electrolyte has to go into the copper cylinder in the middle. This indicates that the makers of this exhibit had not the slightest hint about the principle of those “batteries”. Sadly, that's typical for the ancient alien genre. Another thing: the needle of the gauge moved so steady that it was most probably a motor driven dummy. 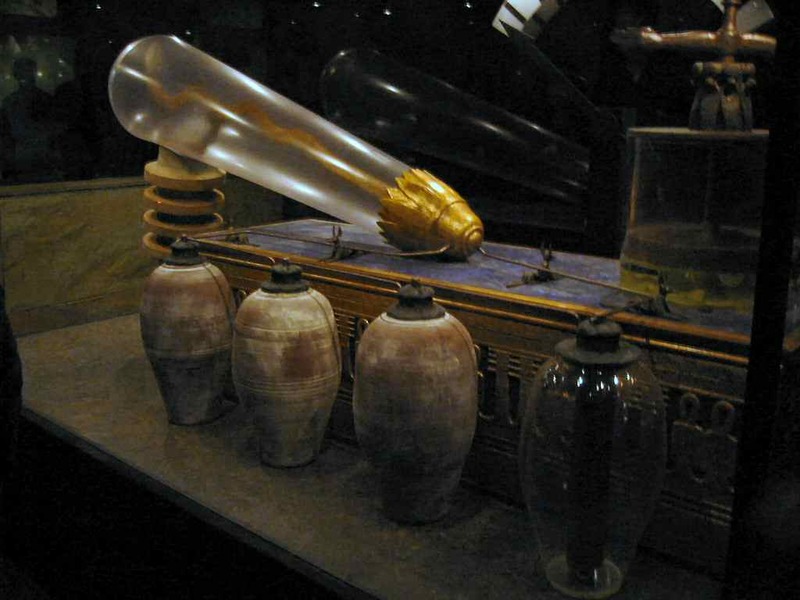 The Garn object is an evacuated glass bulb with the arms of the Djed as electrode. 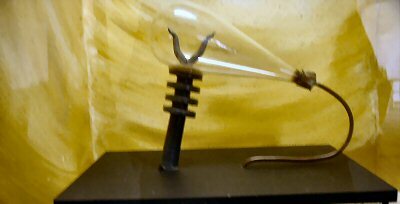 The bulb itself is empty, only when a voltage is applied the inside is filled with a glowing plasma. The evacuated glass bulb and the arms are essential objects for the construction. And what about the object in the Mystery Park? Here a magnification of the frontal part. Oh, there already is something inside! A snake! Which doesn't even glow! And the bulb seems to be made of cheap plastic, and it is not evacuated, there is a slit at the Djed pillar. The arms are only supporting the snake and are no electrodes. And what IS the snake? It Is nothing more than a neon tube, which can be ordered in many different sizes and forms, often used for advertising or company logos. One electrode is the metal snake head, the other is in the lotus flower. This also is nothing more than a prop-up, a façade that has nothing to do with the Dendera hypothesis or the works of Garn, Krassa or Habeck. A fake, that does not work with Baghdad batteries, but with 230 V from a power outlet – together with starters and transformers. The value of this contraption is ZERO, and the association made in the audio comments between this fake and Dendera is fraudulent, IMHO. Yes, it's the wall with the non-working objects. And none of the more than one million visitors seems to have noticed that the essential lamp elements are missing here. So why should ancient astronaut hypothesists do proper research when their consumers are so easily pleased? BTW, the execution of the replica is very poor, compared with the original above. 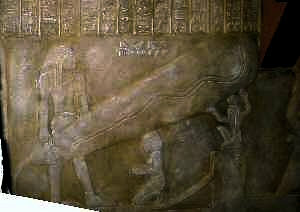 31 The Djed pillar represents according to Egyptologists “power”, “endurance” and “durability”. 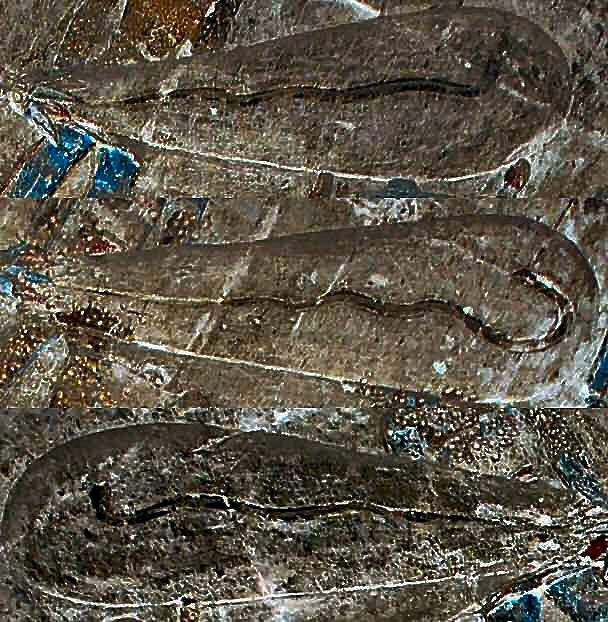 Dipl.-Ing Garn sees them, like the authors, as ancient Egyptian high voltage insulators. 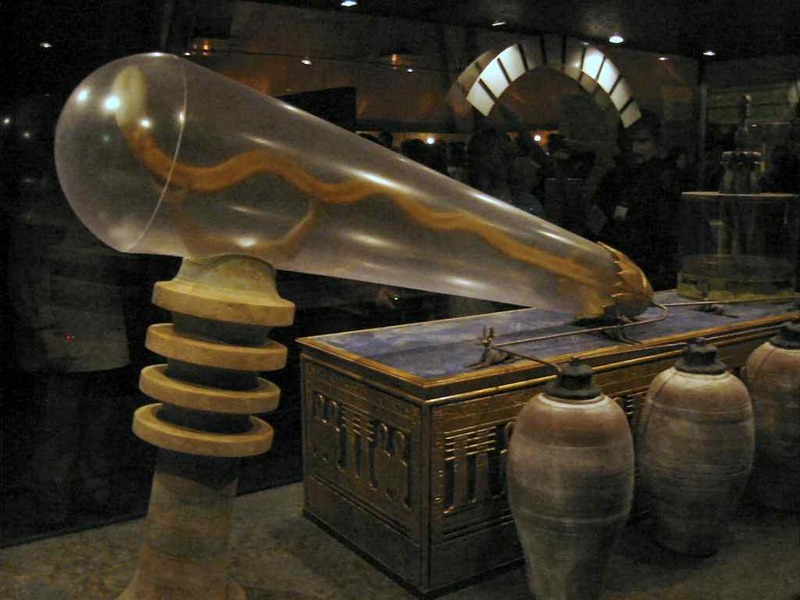 32 Dipl.-Ing Walter Garn with his reconstructed Egyptian luminous element where the Djed pillar impressively confirms its function as an insulator. There are similarities, but one of them seems to be standing upside-down. What does an insulator do? It is a simple device to keep power lines abart or at a distance to grounded objects like power poles, so that no discharges happen, An insulator is nothing more than a spacer. But where are the Djed pillars in our households? The Garn lamp is nothing more than a sort of fluorescent tube like we use today. It needs the same voltage, between 50 and 100 volts when lit, and for the starting process for a short time about 500 volts. And we obviously need no Djed pillars for that. Rain was not an obvious problem in temples and tombs in Egypt – where these lamps should have been used. But now you see why I wrote above that one of these objects is upside down. According to the text on wikipedia the dishes are downward curved – like the roofs on a pagoda – so that the water can run off. The dishes of the Djed pillar are forming funnels – collecting water. 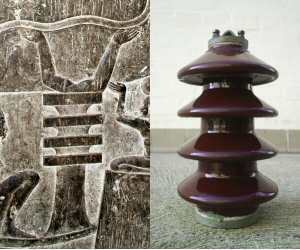 Technically, as an insulator, the Djed makes no sense at all, it is only explained as something technical because “it is there”, and not because it is necessary. That is standard procedure in ancient astronaut lore, like the Blumrich-Ezechielcopter and other “reconstructions”. We can see the cables from the Baghdad-”battery” to the lamp. Both wires are not insulated and need only some small Anubis statues to insulate them against the ground, and they are only a few centimetres apart at the back of the lamp. So why such a gigantic insulator? It does make no sense at all. The attentive observer will notice another really funny bit. 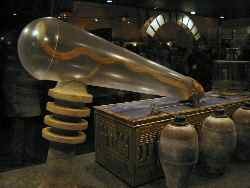 In the Garn bulb and in the book by Krassa and Habeck the electrode-arms are provided with electricity through the Djed pillar. 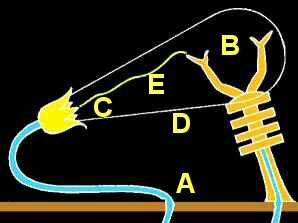 In the fake both power lines run obviously through the lotus-”socket” at the back of the bulb, the cable to the head of the snake can be seen faintly. So the Djed in the Mystery Park is nothing more but a functionless piece of decoration. The best for the last. Let's go back to the description Garn gives about the function of the “lamp”. The cable to the arms runs through the Djed into the glass bulb. Glass is one of the best electrical insulators, so there is no oversized additional insulator necessary. So what is the Djed for? To protect the cable against unintentional contact only a small ceramic tube is necessary. The arms are isolated by the glass bulb, so what is the use of the Djed? Isolators of this kind aare used do keep distance between objects with different electrical charges. For example a 20000 volts power line that hangs below a 150000 volts line. Or a power line that hangs down from the arms of a grounded power tower. The discs prevent water from shorting out the lines. But here the top end of the Djed has exactly the same charge as the lower end. There cannot be a short circuit because both ends are already connected, by the cable running through it. The Insulator here also has no function at all, it is just a design element used to look like the reliefs. And Garn is REALLY a Dipl-Ing for electrical engineering? Hard to believe. What is the conclusion of this? Well, the Djed makes no sense at all as an insulator, it is also constructed the wrong way round. The whole technical explanation of the scenes make no sense at all. Therefore I will leave the technical analysis and show on the next pages what Egyptologists tell us about these things.